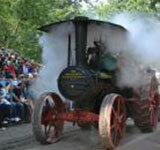 Antique farm equipment, tractor-pull, food, music, and a Threshing Bee. Enjoy a weekend in the countryside of Sycamore with tractor pulls, antique farming equipment, and more! View calendar of events for dates.